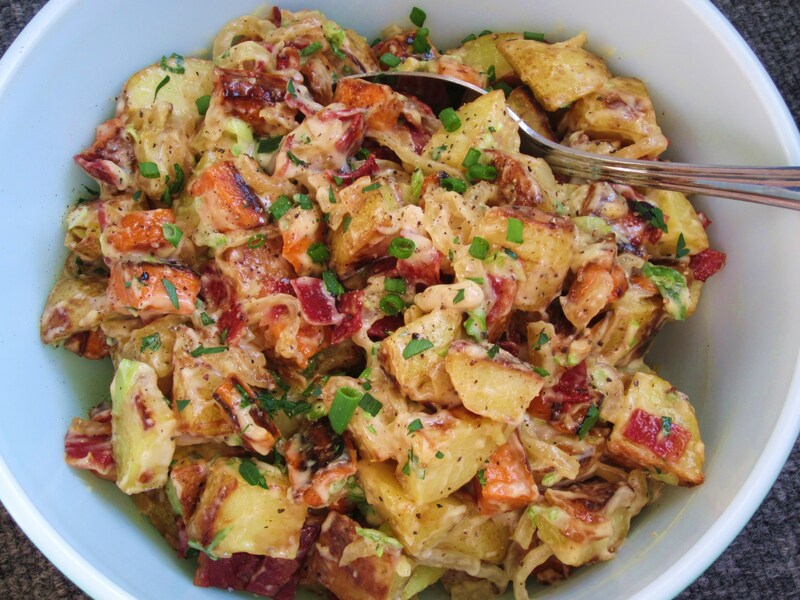 This is not your average picnic in the park, church potluck, or family reunion potato salad. I made dinner this weekend for my Grandma and Grandpa’s 60th wedding anniversary, and this recipe remix got rave reviews by everyone. Definitely keep it posted on your fridge for all summer parties that require a side dish (or all year for winter too). Great 4th of July recipe! Just double or triple the batch for a large party. 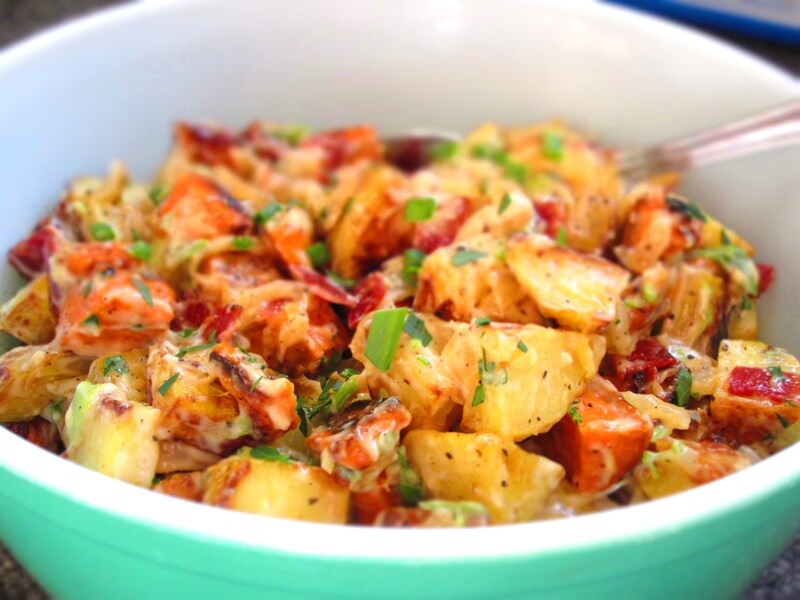 A warm mixture of two kinds of roasted potatoes, crispy bacon, and sweet caramelized onions all tossed in a light, creamy, roasted garlic dressing….now that’s a modern day potato salad. I think roasted garlic is underrated and one of the finest things on earth. Try it out and you’ll want to add it in every dish you make, like roasted vegetables, hummus, garlic bread, brownies. Okay, maybe keep it out of dessert, unless of course, you’re some kind of Iron Chef. Along with my potato salad I made orange honey bbq chicken, sauteed corn, cherry tomatoes and green beans with basil, garlic wheat bread (with extra roasted garlic) and a surprise dessert you don’t want to miss, coming soon! 1. Preheat oven to 425 degrees. Cover a rimmed baking sheet with foil sprayed with cooking spray. Layer cut sweet potatoes, Yukon gold potatoes and whole peeled garlic cloves in the prepared pan. Drizzle with 1 T. olive oil, salt and pepper; toss with hands to coat well. Bake for 20-30 minutes, or until caramelized and tender (turn over half way through baking – may need to remove garlic before potatoes if it starts to burn). Remove roasted garlic and roughly chop. 2. Place sliced yellow onion with 2 tsp olive oil, salt and pepper in a sauté pan over medium-low heat. Cook for 20-25 minutes, or until golden brown and caramelized. 3. Remove onions when finished, and in the same skillet cook chopped bacon until browned and crispy (or cook in oven on a broiler pan or in microwave). 4. Combine mayo, mustard, roughly chopped roasted garlic, lemon juice, salt and pepper in a blender or food processor until smooth (can be made ahead and refrigerated). 5. 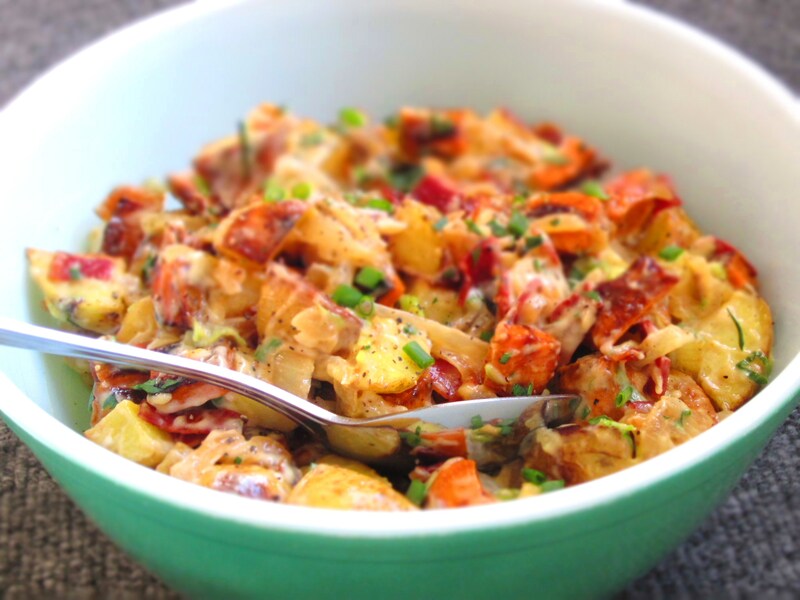 While still warm combine roasted potatoes (warm in oven a few minutes if needed), caramelized onions, cooked bacon, dressing, green onions and parsley in a large mixing bowl until well combined and coated with dressing. Serve warm, or room temperature with garnish of parsley if desired. Serving size about 1/2 – 2/3 cup salad.